If it feels like we have had a lot of warm days so far in October, you’re not mistaken: Denver is now a not-insignificant +2.2℉ above normal for temperatures month-to-date. In fact, the last 7 consecutive days (including today) have featured well above-normal temperatures, and over this one-week period, we’re actually averaging a sizable 7.7℉ above normal. There are few forcing mechanisms to push our current blocky jet stream configuration out of its current orientation. That said, we will have a very short-lived respite from above normal temperatures during the middle of this week as a weak trough of low pressure and associated cold front pushes through the area Tuesday night. That likely means our well-above normal high temperatures today and Tuesday (in the mid-to-upper 70s, which is >10℉ above normal) will be pushed to closer near 60℉ on Wednesday. Also, scattered showers may accompany this system late Tuesday into early Wednesday, but most models are quite bearish regarding precipitation potential in #Denver -- probably <0.10” of rain can be expected. Behind this weak, and short-lived cold front, a ridge of high pressure will build into the area anew by Thursday into Friday, bringing temperatures right back up to well above-normal levels by late week into the weekend. In fact, I wouldn’t be shocked if we flirt with the 80 degree mark again by this coming weekend -- which would imply close to record-high temperatures once again. 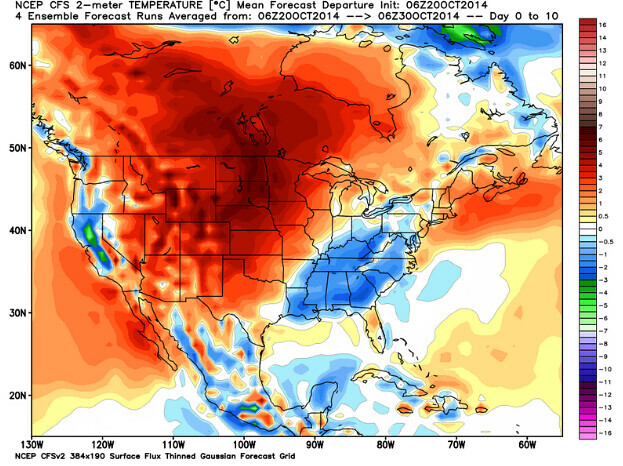 Note forecast temperature anomalies over the next 10 days from the CFSv2 shows above-normal temperatures continuing. We all know above-normal temperatures can’t last forever, and we are now beginning to see some indications that this warm, dry pattern over the western US may begin to break down towards the end of the month. 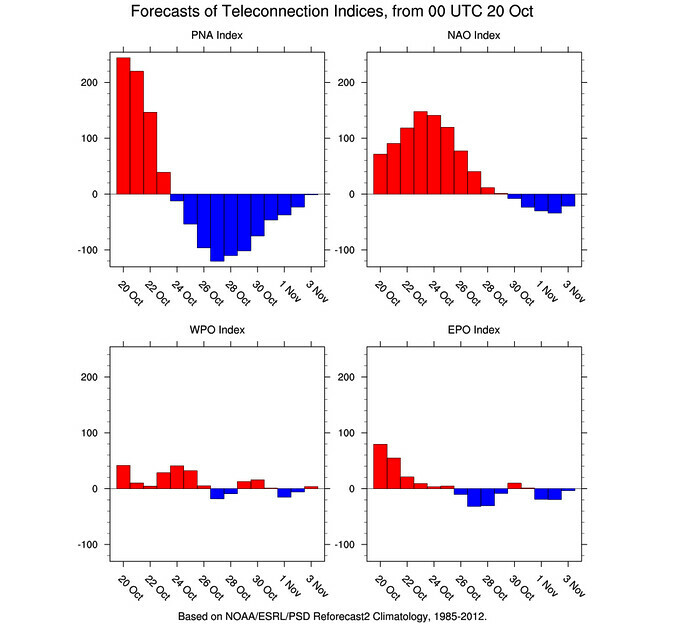 This is a bit more technical, but we’re currently under a strong +PNA pattern, which favors a ridge over the western US; you can see, however, that teleconnection forecasts weaken the +PNA considerably over the next few days, and even suggest it may go negative by next week, which could support a turn to colder temperatures. 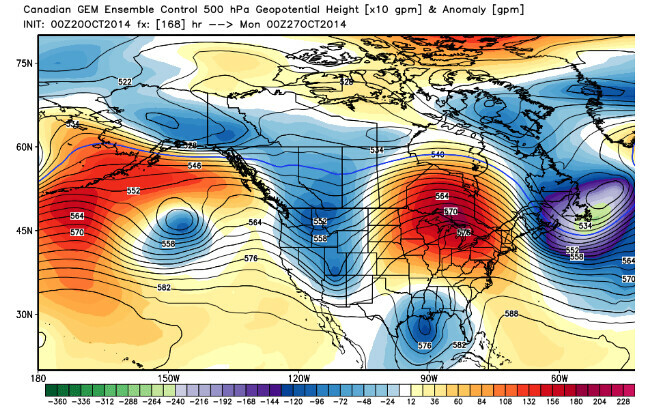 As our +PNA begins to collapse, we can expect an upper-level trough developing off the coast of the western US. Indeed, all medium-range models do show an offshore trough by next weekend. Most models believe this trough will come ashore by around Monday of next week, but there are some fairly large differences in regards to timing, strength, and location of this trough. Those details will need to be sorted out before we can get a clearer image of exactly what effects this trough may have on weather around our neck of the woods. Here is a look at what the Canadian GEM control run is showing valid 6pm Sunday, October 26. As such, the period next Monday through Wednesday may offer unsettled weather, with the possibility of cooler temperatures, more clouds, and the chance for some precipitation, particularly in the high country. It is too soon to know with any more confidence exactly how this trough will impact our weather, but we’ll probably have a much better handle by mid-week. I don’t think, however, that it is this trough the puts a decisive end to our warmer-than-normal pattern. Indeed, most models start to warm us up again by the middle of next week, as high pressure once again builds right back into the region. Our eyes will then be on the next upstream trough which is likely to pay us a visit during the first few days of November. I believe that it is this system which offers better chances for finally squelching our warmer-than-normal pattern, as well as bringing notably cooler temperatures and the chance for snow -- perhaps even on the Plains. In short, while it’s a ways out, I believe that the period November 1-3 needs to be monitored for possible impacts from a (deep?) 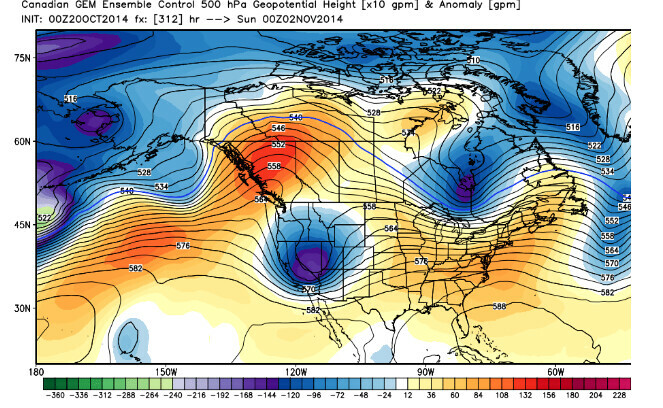 trough aloft, which could finally bring central Colorado a taste of wintry weather! 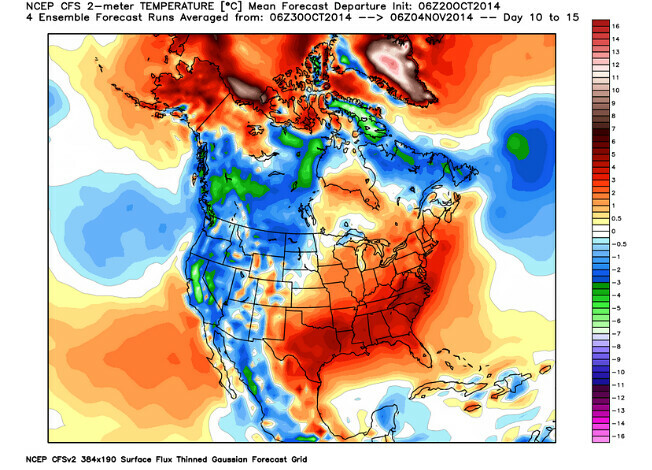 Here is the latest Canadian ensemble control run valid 6pm on Saturday, November 1.